This thesis examines the anatomical locations of the dynamic pressures that create the first five footprints when a standing person starts to walk. It is hypothesized that the primary activity starts with the dorsiflexion or lifting of the great toe. Consequently, the metatarsophalangeal region of the forefoot was studied from three directions. Viewed side-on, the great toe free-body is found from a detailed post hoc analysis of previous kinematic data obtained from cadavers to operate as a cam. The cam model also follows closely from Aristotle's ancient description of the hinged instrument of animate motion. Viewed in coronal cross-section, the first metatarsal torsion strength was estimated in 13 humans, 1 gorilla, 3 chimpanzees, 1 orangutan and 1 baboon set of dry-bone specimens of the hands and feet. The first metatarsal bone alone contributes 43% of the total strength of all the metatarsal bones. A result unique amongst the hominids and apes studied. Viewed in horizontal plan, the dynamic components and principle axes of the footprints of 54 barefoot humans (32 male, 22 female, age 32 +-11 years) were studied whilst standing on a 0.5m pressure plate, and then immediately when walking over a 2m plate (4 sensors per cm2 sampled at 100hz). Two footprints were obtained during the initial stance posture, and the first three footprints of the initial walk. Three new principles of animate motion were deduced from the divergent results obtained from complete and dissected cadavers: The metatarsal cam (from the sagittal side view) the ground reaction torque (from the frontal coronal view) and the amputation artifact. The philosophy of experimenting on inanimate cadavers rather than living subjects was intensively researched. Instead of assuming that gait is a uniform or regular motion as is usual, the foot was analyzed rather as if it was a beam attached to the ground. Engineering equations were used to determine the flexural properties of the foot every 0.01 seconds, including the principle axes, radius of gyration and the local shear stresses on the sensors spaced 5-7mm apart. A sequence of these impressions creates a mathematically animated model of the footprint. The local force under the foot was normalized against both the total force and contact duration. The forces under the foot were each divided between 10 anatomical regions using individual masks for each foot strike. Producing a 54-subject database from which the normal behavior of the foot could be quantified. The group showed a surprisingly low right foot step-off dominance of only 54%. The combination of the radius of gyration and impulse in particular produces a succinct but powerful summary of the footprint during dynamic activity. The initial angle and magnitudes of the loads that are applied and removed demonstrates that the body first rocks onto the heels after the instruction to walk is given. The feet simultaneously invert and their arches rise off the ground as anticipated. The principle axes were then animated in a mathematical four-dimensional model. The horizontal radius of gyration is on average 5 cm during heel strike, but increases to 20 cm as the forefoot comes into contact with the ground, finally rising to 25 cm at toe-off. Significantly the applied load during the fore-foot loading phase is more widely distributed than the load being removed. A new and unanticipated result that is believed to be a special characteristic of the animate foot. 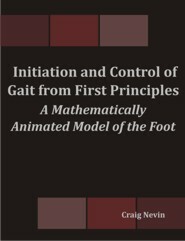 The standard deviation of the force under the great toe is the first mechanical parameter to converge in the 54 subjects, conclusively verifying the hypothesis that the great toe both initiates and controls gait.